Between Los Angeles and San Francisco lie many of my favorite oceanside spots in California, including the seaside town of Cambria. Cambria actually lies right smack in the middle of California’s two great cities, 240 miles from both Los Angeles and San Francisco along the scenic Highway 1. Cambria has a lot to offer visitors, including great shopping, beaches, scenery, outdoor recreational activities, and excellent dining spots. 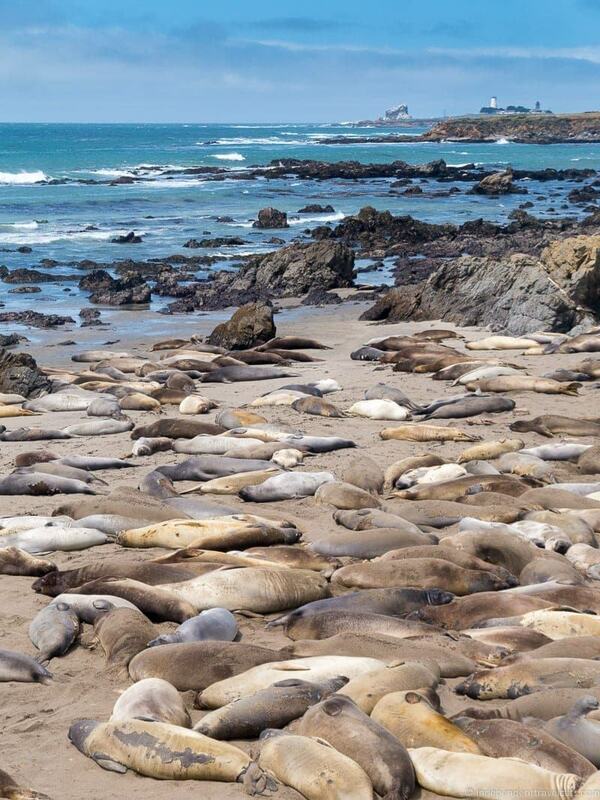 It is also located a very short drive from the popular Hearst Castle and the elephant seal rookery near San Simeon. If you are planning a trip along California’s Central Coast, perhaps as part of a Pacific Coast Highway road trip or California road trip, be sure to consider spending some time in Cambria. It is both a great weekend getaway for those of us living in California and a great stop for visitors wanting to explore the Central Coast. We’ll share our tips for planning your own trip to Cambria as well as our favorite spots in Cambria. Cambria is located along California’s Central Coast, almost exactly in between Los Angeles and San Francisco. It is located approximately 240 miles north of Los Angeles (3.5 to 4.5 hour drive), 240 miles south of San Francisco (3.5 to 4 hour drive), and 35 miles from San Luis Obispo (approximately 40 minute drive). The fastest route if coming north or south is to take Highway 101, but if you have some time I highly recommend driving Highway 1 (Pacific Coast Highway) at least part of the way as the scenery is beautiful. If arriving by plane or train, San Luis Obispo has the closest airport, San Luis Obispo County Airport, and an Amtrak train station. Bus connections are also available from San Luis Obispo to Cambria and time tables and routes can be explored on the SLO Regional Transit Authority website. Once you are in Cambria, you can reach most places on foot as the town is pretty walkable; however, to get to some of the sites on the edges of town or to reach San Simeon you’ll need transportation. A car is the easiest way to get around, but there are other options. If you are a biker, most sites are easy to reach by biking and you can rent bikes at Cambria Bike Kitchen (call ahead – (805) -909-9050 though as they have limited bikes for rental) or in nearby San Luis Obispo. If you are visiting in the summer, a free trolley runs within Cambria and the area from Thursday to Sunday . You can also reach some places in Cambria (such as Moonstone Beach) as well as Hearst Castle by a public regional bus. How Close is Cambria to Hearst Castle? Very close! It is a short 10 mile drive (takes about 15 minutes) to Hearst Castle from Cambria which is located in the neighboring town of San Simeon. You can also get between Hearst Castle and Cambria by bus or shuttle as noted above. Cambria is pretty year round and there are always things to do, but I would suggest Spring, early summer, or early Fall as the best times to visit for the best weather. It of course depends on what you want to do. 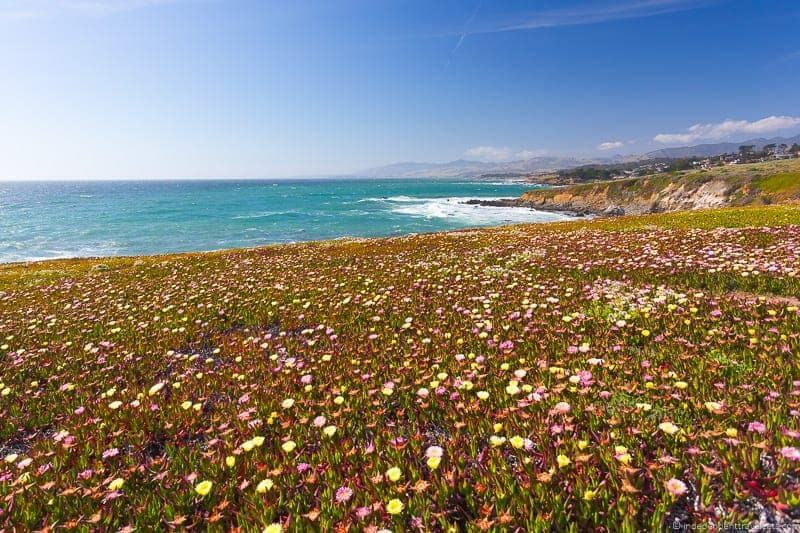 For instance Spring is the best time to view the great wildflowers in this region, Winter brings the Festival of Trees and the Art & Wine Festival, and Hearst Castle runs its fun evening tours during the Fall months. There are annual events and festivals throughout the year, including Pinedorado Days in September, Scarecrow Festival in October, Christmas at Hearst Castle in December, Festival of Trees in December, The Chili Cook-Off, Car & Motorcycle Show in April, and the Art & Wine Festival in January. For event dates and to find out what is happening during your visit, check the Visit Cambria Events Calendar and the events calendar on the Cambria Chamber of Commerce website. Where Should I Stay in Cambria? 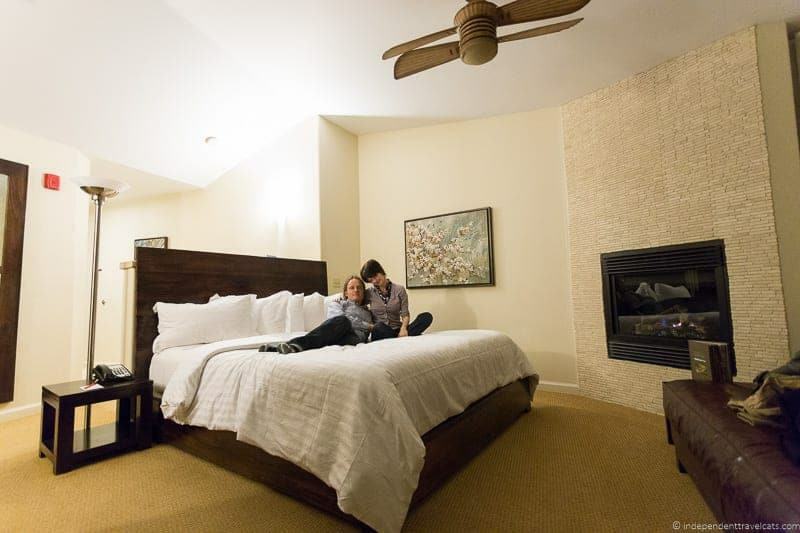 There are a variety of places to stay in Cambria depending on what type of accommodations you are looking for whether it be a full-service hotel, an inn, a bed-and-breakfast, or an apartment vacation rental. You can also consider a stay in nearby San Simeon. How can I Find More Information about Cambria? You can find all kinds of planning information, including info on transportation, lodging, dining, and local events, at the Visit Cambria website run by the Cambria Chamber of Commerce. You can also stop by the Cambria Chamber of Commerce office located at 767 Main Street in Cambria, call them at 805-927-3624, or send them an email at info@cambriachamber.org with any questions. 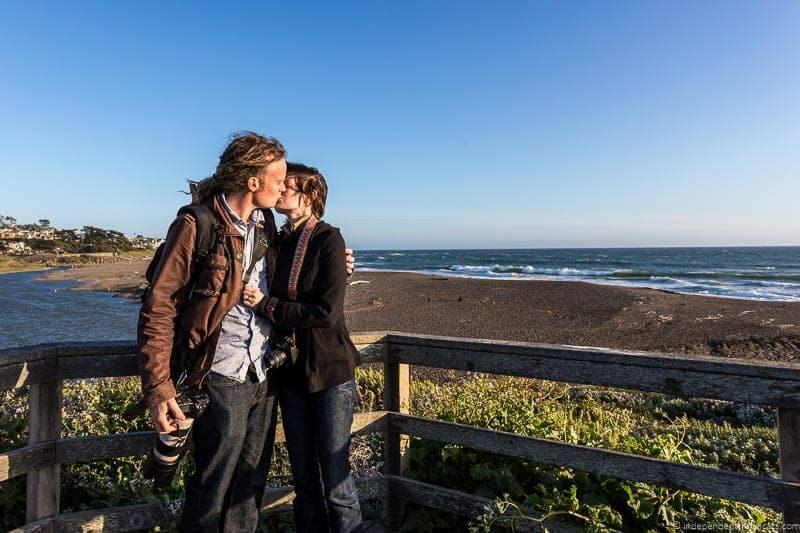 You should also check out Laurence’s post about our visit to Cambria to get his perspective. If you are planning a visit to Hearst Castle, check out my earlier post about tips for visiting Hearst Castle. Depending on your interests, you’ll want to tailor your trip to Cambria accordingly. Some people come to Cambria primarily for shopping and exploring the downtown village, whereas others come for the natural wonders and scenery. Others stumble upon Cambria’s charm after a visit to Hearst Castle and stay to experience the historical sites and explore the great dining options. We’ll explore the various things that Cambria has to offer and share our experiences to help you plan your perfect trip to Cambria. 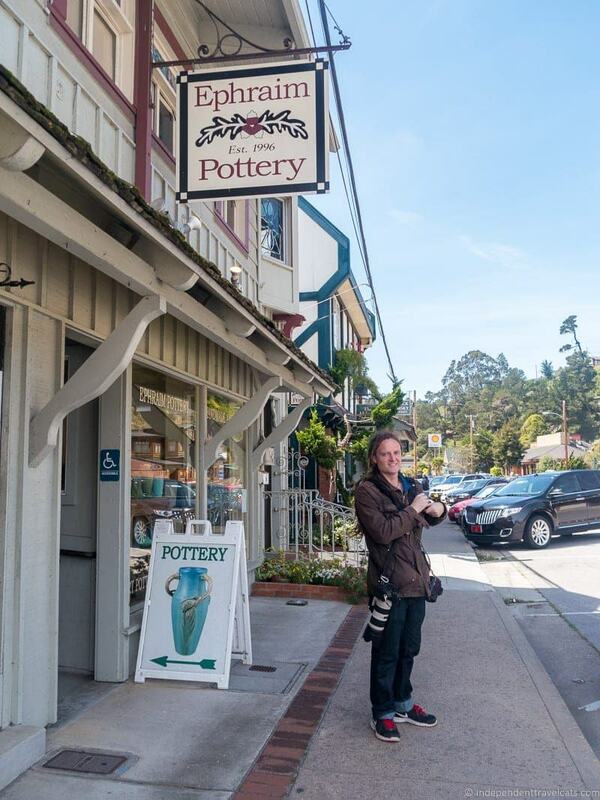 Cambria is well-known for its shopping and the first time I heard about Cambria it was from someone who regularly visits to purchase art and antiques. The town offers a number of local shops within walking distance in the village that are filled with antiques, apparel, artwork, handicrafts, vintage clothing, culinary goodies, and souvenirs. To whet your shopping appetite, here is a list of many of the stores in Cambria. Honestly, Laurence and I are not big shoppers but we did quite a bit of browsing, and we ended up buying some salt water taffy at Among Friends and drove out to Linn’s Farmhouse for some olallieberry goodies and to pet the goats. If you get tired after a long afternoon of shopping, you might want to book a restorative massage or facial at one of the local wellness spas. There are a few areas with beach access in and around Cambria, but there are only a few true sandy beaches as the coast is quite ragged and rocky along this area. However, Cambria is lucky to have Moonstone Beach which has been voted as one of the top 10 beaches in California by USA Today readers. 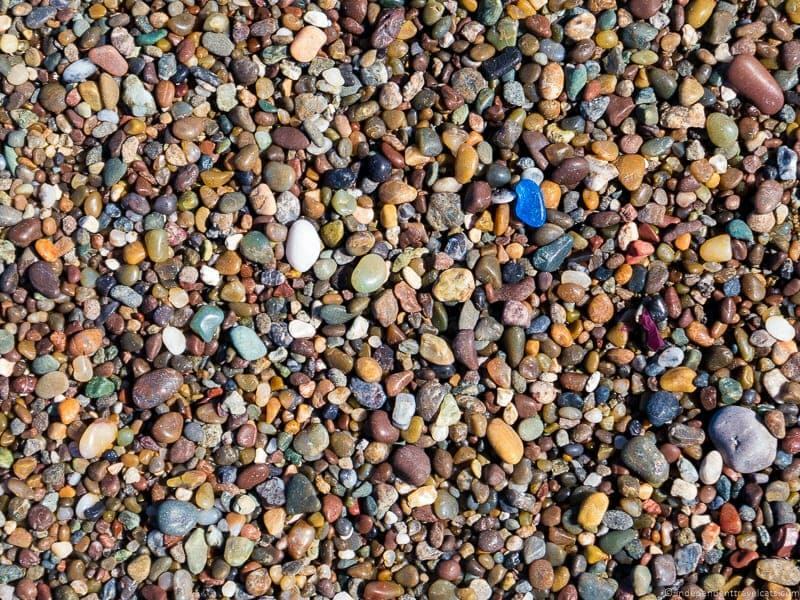 The beach is unique in that the sand changes color depending on the light and is filled with tiny moonstone rocks which are perfect for beachcombers. In addition to swimming, there are also tide pools for exploring, logs to sit on, and a charming one-mile long wooden boardwalk that runs alongside the beach. 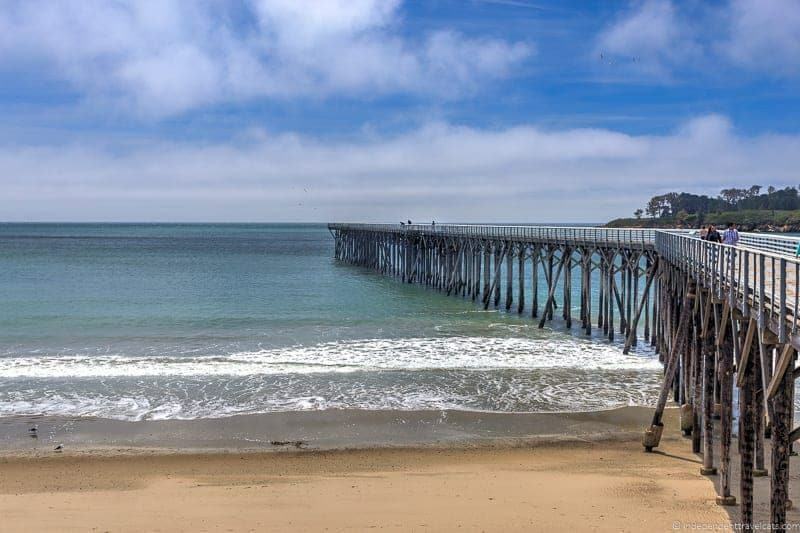 If you are in San Simeon I would check out the William Randolph Hearst Memorial State Beach which offers a small sandy beach and a long wooden pier that is popular with both locals and visitors. 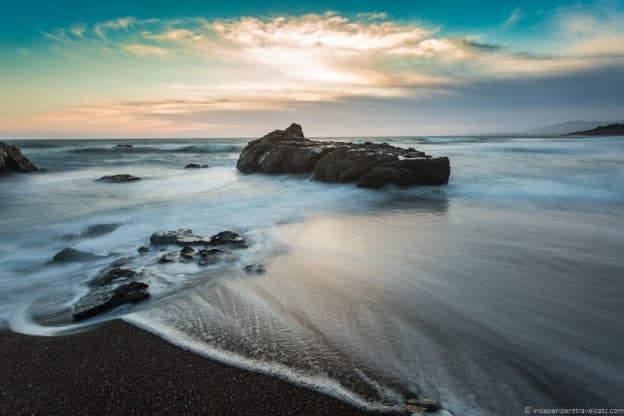 Whether you enjoy hiking, biking, swimming, bird watching, horseback riding, picnicking, or just walking along the beach, you’ll find plenty of reasons to get outside while in Cambria. Our favorite beach area was definitely Moonstone Beach and it is a great place for leisurely walks (on its boardwalk or on the sand), swimming, and picnics, as well as a great place for tide pool exploration, moonstone collecting, and sunset photos. If you are looking for a grassy local spot for the kids to burn off some energy (including a playground and seasonal outdoor swimming pool) or a place to just relax away from the crowds for a walk or picnic, consider Shamel Park. 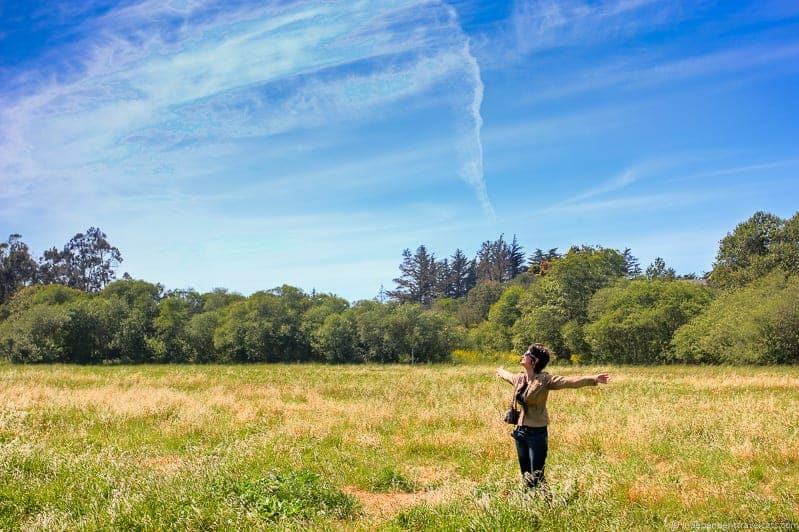 Our favorite place to hike or walk (some trails can also be biked and a few are open to horseback riding with permission) is definitely the Fiscalini Ranch Preserve. The ranch features a number of trails across over 400 acres of protected forest, riparian habitat, and grasslands and the preserve also has regular special events. Laurence and I walked a few of the trails and the Bluff Trail is a definite crowd pleaser as it hugs the rocky coastline, offering dramatic ocean views, wildlife, and wildflowers (in the Spring). Speaking of wildflowers, if you are here in Spring make sure you get outside of the main downtown to see some of the great wildflowers. 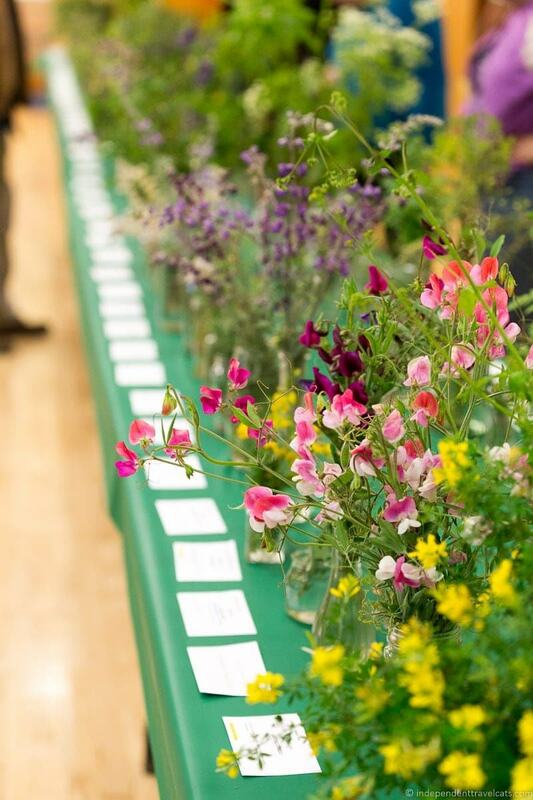 We actually happened to visit during the Annual Cambria Wildflower Show and got to see the full range of wildflowers that grow in the region. If animals are your thing, make sure to stop at the Elephant Seal Rookery in nearby San Simeon. Also if you feel like doing some good during your visit, consider checking out some of the available stewardship activities in the area. If you are visiting this area, I highly recommend a visit to Hearst Castle. 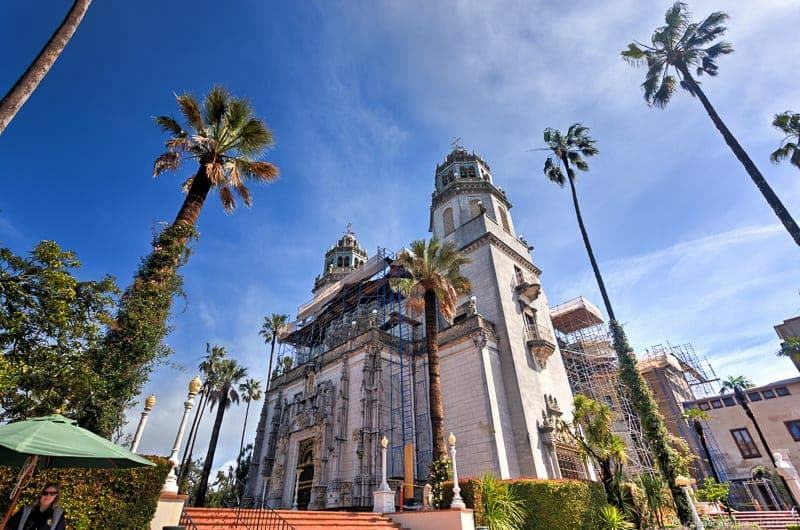 I have toured Hearst Castle twice and enjoyed it both times and would not hesitate to return for a third visit (still really want to do an evening tour here!). The place is amazingly well-run, the guides are great, the film is very well done, the house is filled with amazing art, the gardens are beautiful, and the life story of William Randolph Hearst is fascinating. 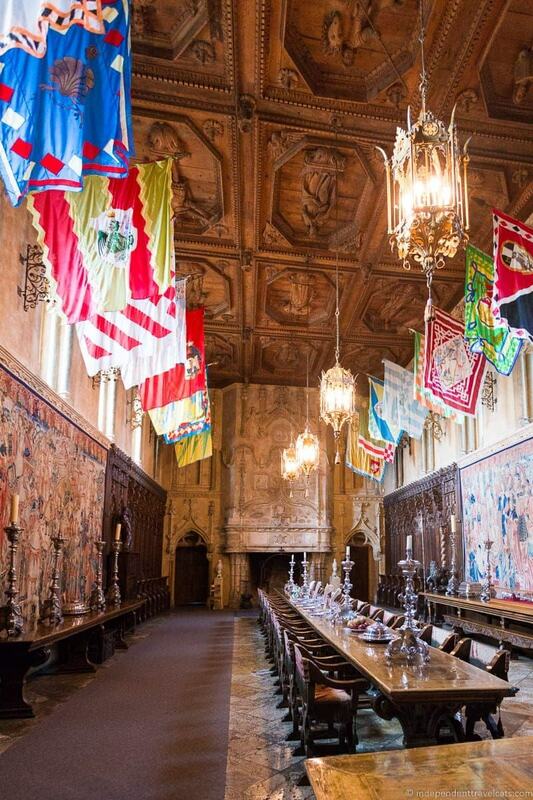 If you are planning a visit, you can read my full review and advice for visiting Hearst Castle post that I wrote a couple of years ago. 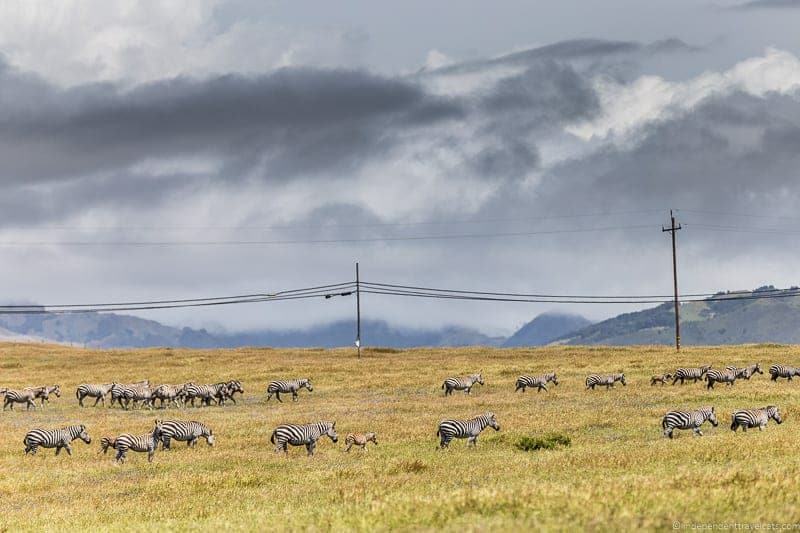 When driving near Hearst Castle, you might be lucky enough to spot zebra in the fields which are descendants of Hearst’s zoo (I’ve seen them 1 out of 3 times). But there are other things to do in tiny San Simeon other than just visit Hearst Castle. If you enjoy lighthouses, I recommend doing a guided tour of Piedras Blancas Light Station (note you can only tour the lighthouse on certain days with a guided tour so plan ahead) and if you like historical buildings take a short detour to what remains of the Old San Simeon Village (includes mainly the historic Sebastian’s Store and an old schoolhouse). You’ll also want to visit the Elephant Seal Rookery where thousands of elephant seals hang out year round, at times you’ll find only a handful on the beach and at other times you might see thousands. You can simply park your car and walk along a viewing area to see these giants lying and swimming around below. We saw thousands on the beach during their molting season in May and then we saw only about a dozen or so on the same beach during a quick stop in August so the numbers really depend on the time of the year as they go through their life cycle of molting, breeding, and birthing. San Simeon also has a few beaches that are not covered in elephant seals, including the William R. Hearst Memorial Beach which has a great long wooden pier and is next to the Coastal Discovery Center, which includes free educational exhibits about the Monterey Bay National Marine Sanctuary and local sealife. For more San Simeon attractions, activities, and events, check out the San Simeon Chamber of Commerce website. 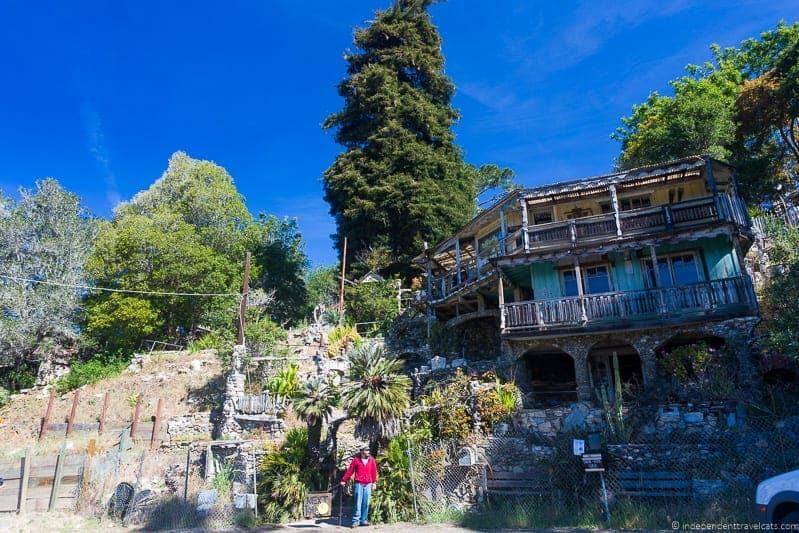 If you are looking for something a little offbeat and you enjoy quirky attractions, consider a tour of Nitt Witt Ridge which has been designated as a California Historical Landmark. Nitt Witt Ridge is a home built essentially of found objects (some may have been more “borrowed” than found) collected by the eccentric and now deceased Arthur Harold Beal (nicknames included Der Tinkerpaw and Captain Nitt Witt). 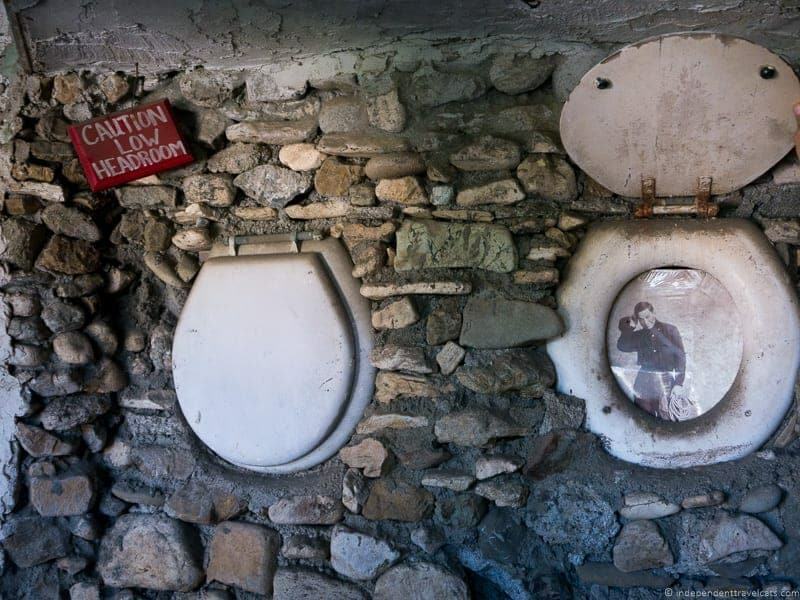 As you walk around, you’ll discover that all sorts of objects were used in the construction of this home, including toilet seats, beer cans, old TV sets, car parts, abalone shells, and even tiles from Hearst Castle. The home was considered an eyesore by many of the local residents during Beal’s lifetime and its presence continues to create some local tension. Today the home is owned by Michael and Stacey O’Malley who give tours by appointment (phone: 805-927-2690) and the tour includes a short film interview of Mr. Beal. During the tour you get not only a guided tour of the home, but you also get a good insight into Mr. Beal and into some of the local politics. Michael gave us a tour and he is a very friendly and approachable person and seemed very dedicated to maintaining this property. 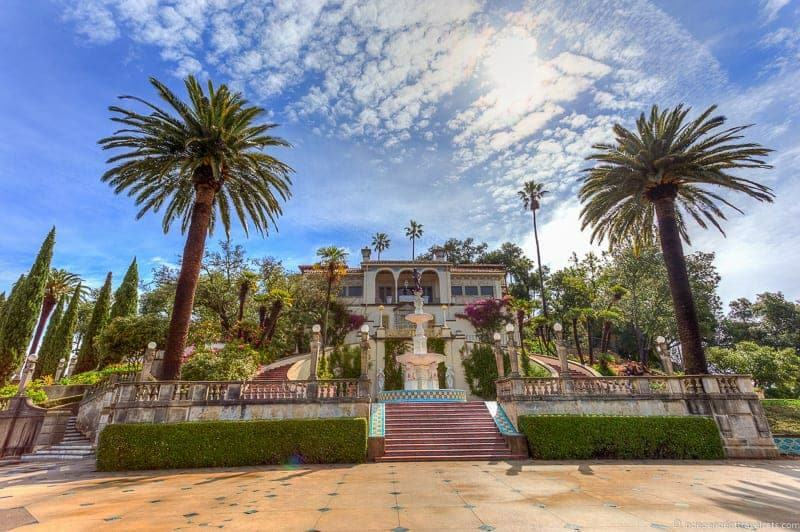 Touring this home is not for everyone, but it is interesting to compare William Randolph Hearst and Arthur Beal’s very different versions of a “Castle on the Hill”. 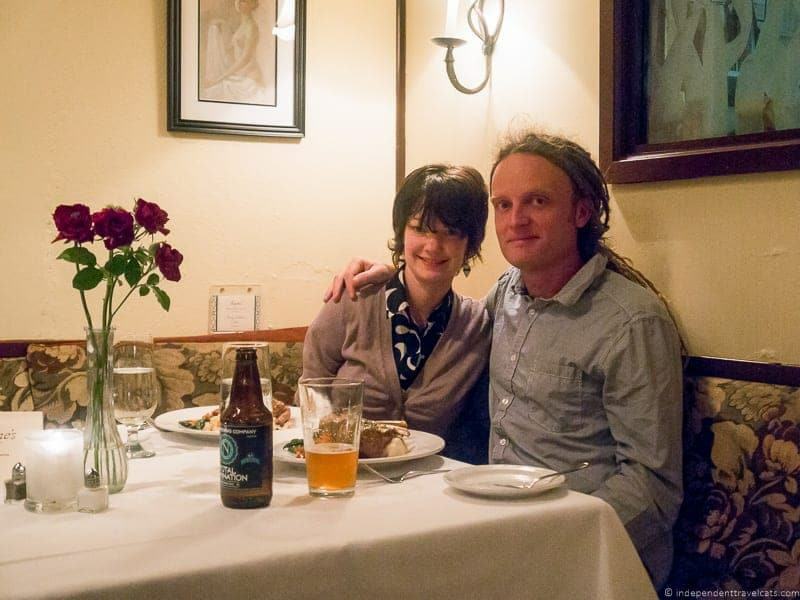 One of the things I remember most about our trip to Cambria was how great we ate during our trip. I was honestly very pleasantly surprised by the number of great dining options in Cambria, from simple pub and diner style food to oyster bars to more fine dining options. We were here for three days and only tried about half the places we wanted to fit into our trip. For more simple and budget-friendly options we recommend a big American breakfast at Linn’s Restaurant (yummy muffins!) 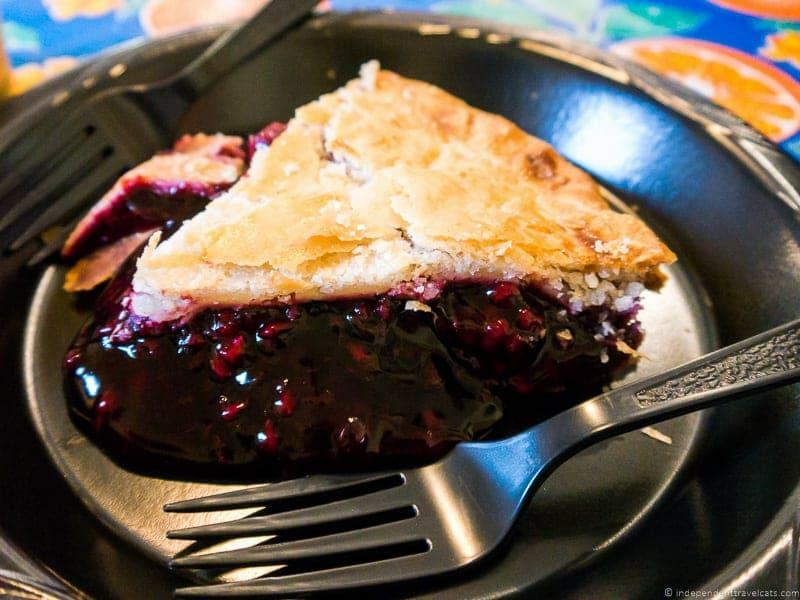 and a light lunch at Linn’s Easy as Pie where you must try slice of olallieberry pie. The Linn family owns several shops and restaurants in Cambria so you’ll see their name a lot if you spend some time here. We also had a great lunch from the eclectic global menu at Robin’s Restaurant, sharing a meze plate and lamb burritos. 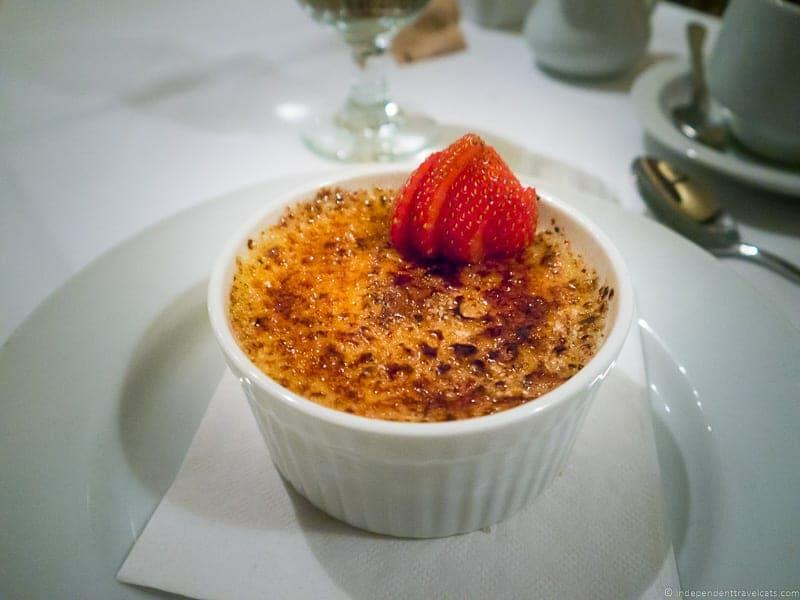 For dinner, we had two great sit-down meals at both the Black Cat Bistro which specializes in farm fresh food and Madeline’s Restaurant which serves American and French style dishes. 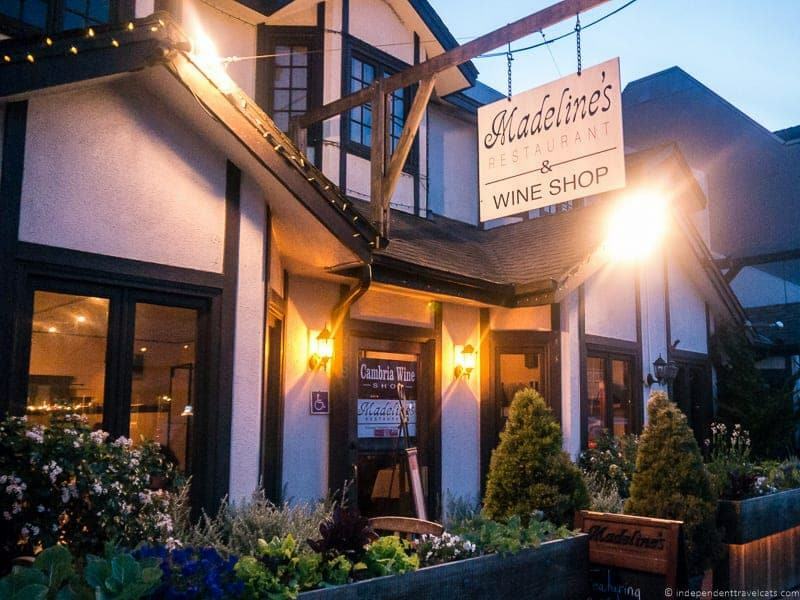 We did not have a bad meal in Cambria, but if we had to choose a favorite, our favorite meal was probably our dinner at Madeline’s which included crab and lobster cakes, rack of lamb, and creme brulee, and we totally agree with the amazing restaurant reviews online. 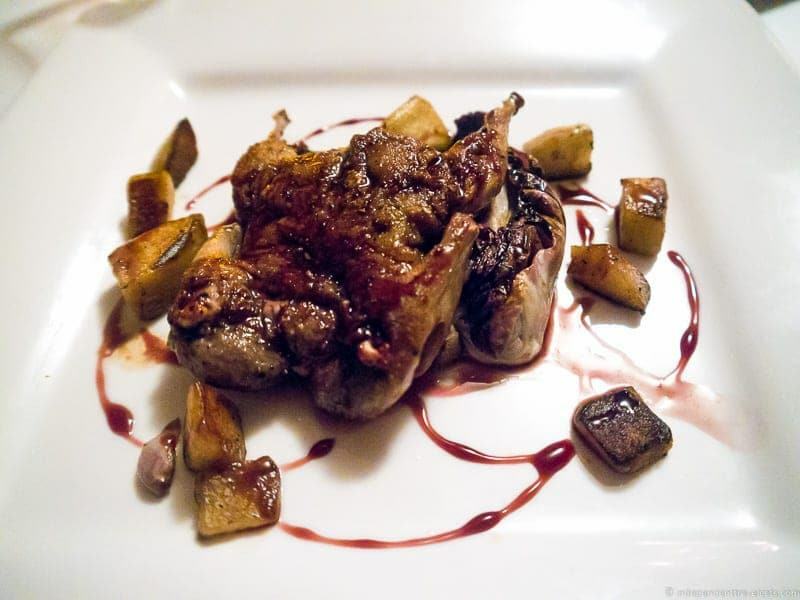 We highly recommend trying a few restaurants while you are in town and here is a good list of many of the local Cambria restaurants. 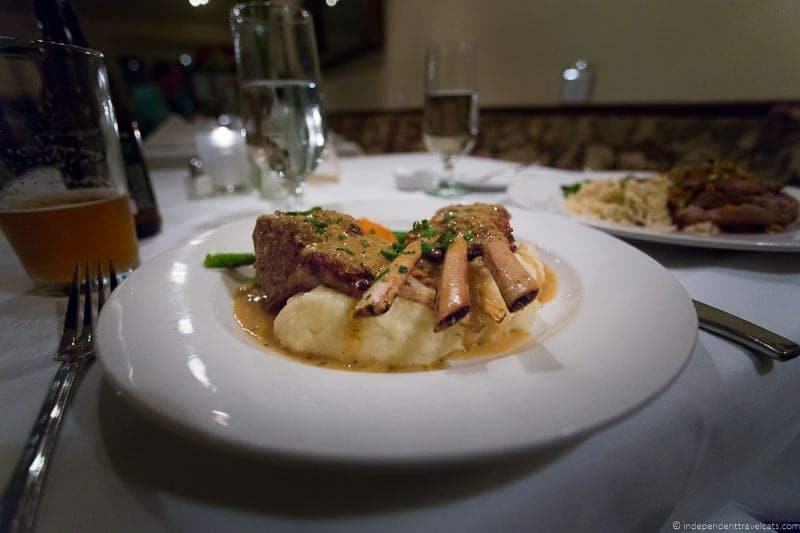 For dinner, you’ll want to be sure to make reservations to ensure a table, especially on weekends. 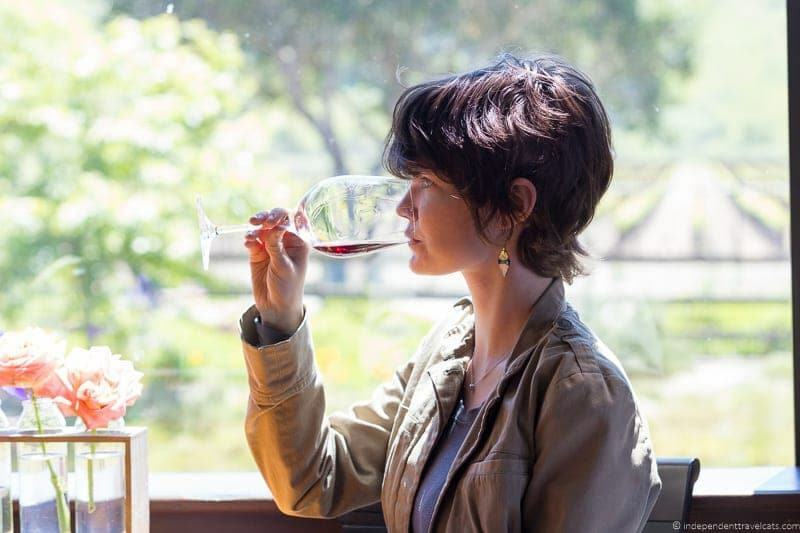 The Central Coast is not nearly as popular (or crowded) as the Napa Valley or Sonoma areas in terms of California wine tourism, but the region is now widely recognized for its wines. 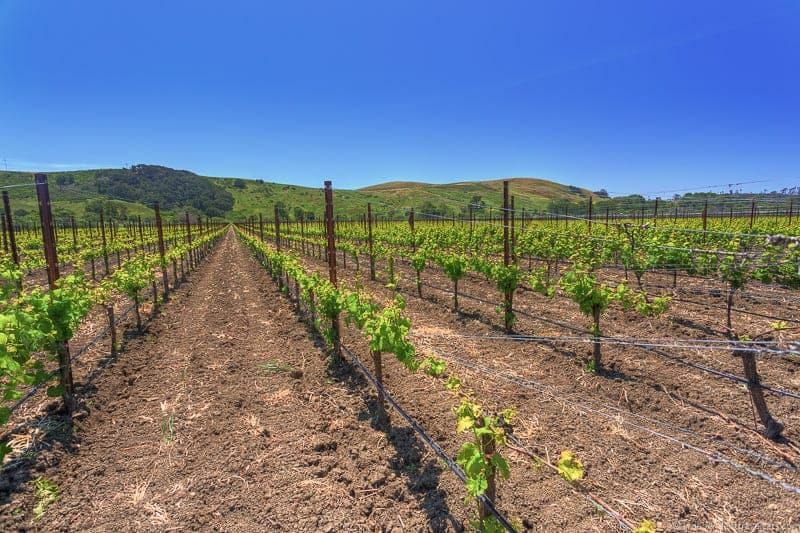 The fertile valleys of this region has long made for great agricultural production and now you’ll find wineries and tasting rooms all along the Central Coast from Santa Cruz to the Ventura region. Cambria has several wine tasting rooms, but only recently has it had its own local winery. Stolo Family Winery is a small family winery that harvested its first vintage in 2004. The winery’s vineyards are located quite close to the coast and the cool foggy climate contributes a unique taste to its wines, which include pinot noir, chardonnay, sauvignon blanc, syrah, and most recently a rosé wine. The winery has a public tasting room located just a few minutes drive from downtown and Laurence and I did a tasting during our visit. My favorites were the chardonnay and the rosé, and Laurence liked both the syrah and the sauvignon blanc. If you are interested in checking out a number of wineries along the coastal area near Cambria, consider driving the Pacific Coast Wine Trail. 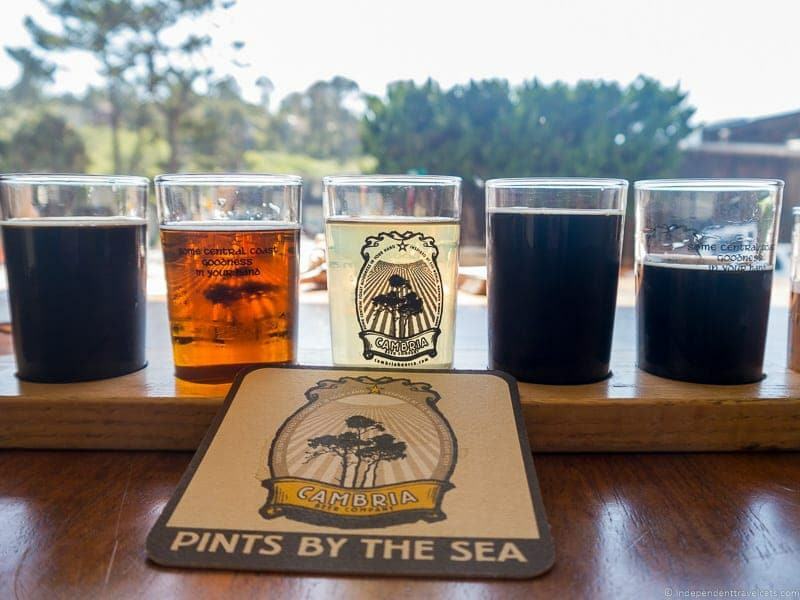 If beer is more your style than wine, you may want to check out the Cambria Beer Company which brews a number of craft beers and is located right in downtown Cambria. The brewery produces small batches and has one of the friendliest and laid back tasting rooms I’ve been to with one group playing a board game at one table and a multigenerational family sharing another table during our visit. The beers on tap change regularly and my favorite was a porter and Laurence’s was an amber; we didn’t love all the beers we sampled but we had a lot of fun tasting and rating them. If you are interested in a more extensive beer tasting experience, consider a tour of several of the craft breweries in the Central Coast Brewers Consortium. 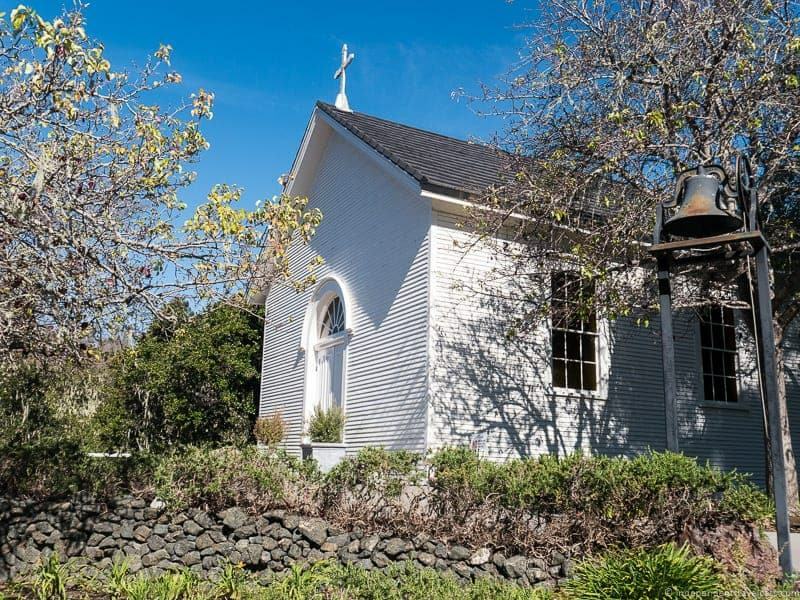 Cambria has a number of historical sites and you can learn a lot about the area’s history by visiting the Cambria Historical Museum which happens to occupy the site of the Guthrie-Bianchini House, one of the oldest homes in town. Many other old historic buildings still exist within the village, including the Music House, Camozzi’s Bar and Hotel, the Santa Rosa Chapel and cemetery, and the old-time saloon building known as The Bucket of Blood. If you walk around the village, you’ll probably notice the historical markers denoting many of these historic buildings. You can book a historical walking tour with a docent through the Cambria Historical Society that will cover many of the historical sites in Cambria or put together your own self-guided tour from the list of historical town sites visited on the historical society’s tour. 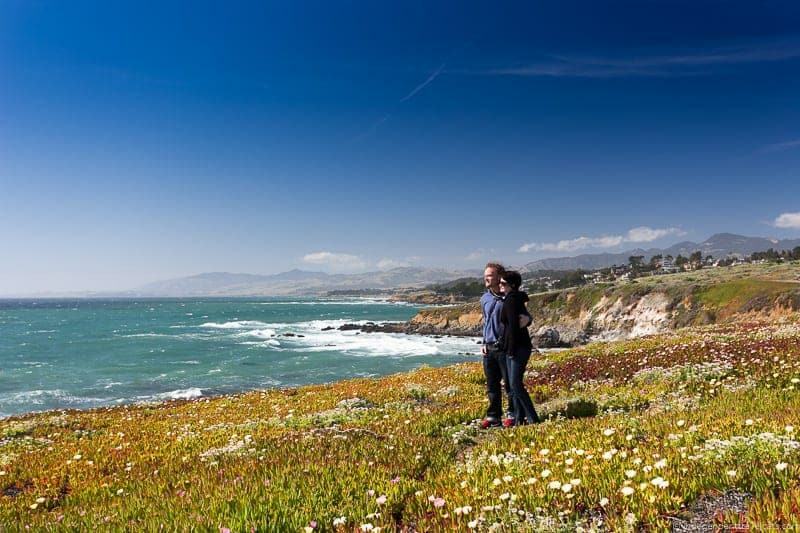 Cambria is the perfect size of town for a weekend romantic getaway, ideally a three-day weekend so you can savor your stay. We spent a lovely three-day weekend in Cambria during the Spring. If you are coming here as a couple, there are a number of things you may want to put on your itinerary. 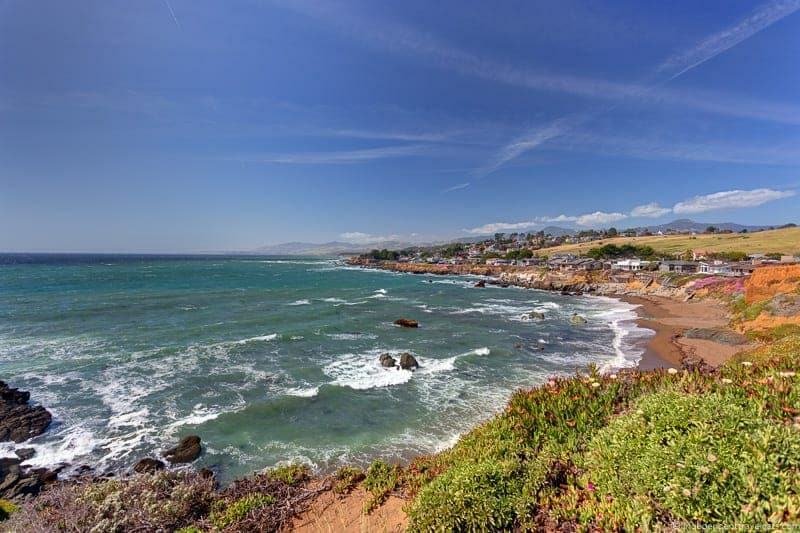 The village of Cambria is perfect for strolling around leisurely hand in hand during the day whether you are shopping, taking in historical sites, or just sightseeing. Consider a visit to Stolo Family Winery or do some wine tasting downtown or at your hotel bar. 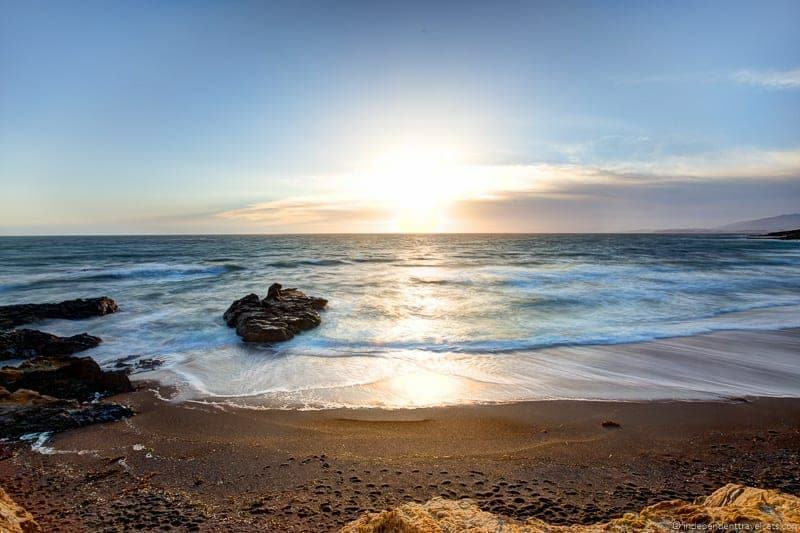 At night, consider a stroll along the boardwalk and watch the sunset from Moonstone Beach, or alternatively walk along the dramatic Bluff Trail at Fiscalini Ranch Preserve. Plan at least one special intimate dinner together at a local restaurant and enjoy a great meal. You might also want to consider attending one of the local theatre or live music productions if one is happening during your visit. Finally, choose a lodging option that will spark romance depending on your personal preferences, whether it is a bed-and-breakfast on the beach, a boutique hotel with room service, a rented apartment, a campsite, or a cozy little inn. We personally stayed in El Colibri Boutique Hotel & Spa and would definitely recommend it. The room was spacious with a large Jacuzzi tub in the bathroom, a fireplace, a great bed, and all the amenities we wanted. Our stay (check the hotel specials) also came with welcome sangrias and an appetizer plate at the El Colibri Bar downstairs! The El Colibri is also ideally located right next to Moonstone Beach (the wooden pier runs right up against it) and a public bus stop. We really enjoyed our long weekend in Cambria and I think the town has plenty to offer a variety of travelers from great outdoor scenery and beaches to shopping and wine tasting. It is a great stop if you are heading up or down the Highway 1. Hearst Castle is definitely the biggest tourist draw in the region, but I would highly recommend sticking around this area for at least a day or two to fully explore this area. Whether you are drawn more to the rich man’s Hearst Castle or the poor man’s Nitt Witt Ridge, you are sure to find plenty to fill up your Cambria trip itinerary. 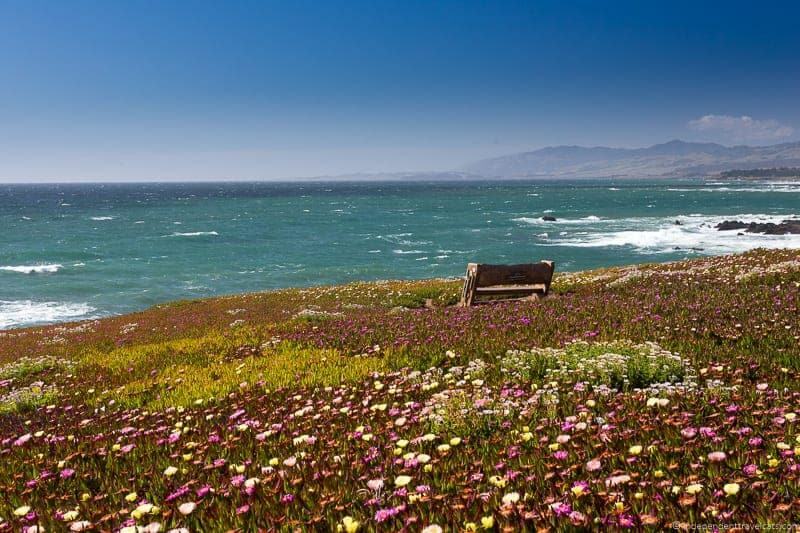 If you were planning a visit to Cambria California what would be on your itinerary? If you have visited this area, we’d love to hear your recommendations on best places to visit in Cambria and the surrounding area. As always, we love to hear any thoughts or questions you may have! I really enjoyed your article and review on Cambria. We are headed there in a few days and I’m so looking forward to seeing this quaint beach town. I’ve been up and down the coast of California, but never stayed in Cambria. Your pictures are beautiful and you both are such a cute couple. Read lots of online reviews of this charming place but yours is by far the best. I’m sure we’ll have a wonderful time….thank you for all the recommendations! Fab blog; we only spent one night in Cambria but the sunset over Moonstone Beach remains one of my favourite holiday memories! I have been lucky to spend 5 years in San Francisco with several Central Coast trips to some really great towns. There are so many great towns to visit in this area of the state. Love Hearst Castle and the drive up the coast to San Fran. Seeing zebras roaming the plains in the US spun me out! Yes, I am so happy you got a chance to visit Hearst Castle and got to see the zebras. Most people don’t get a chance to see them as they are often not close enough to the road. Thoroughly enjoyed your piece about my home! Actually though, the elephant seal rookery, is in Piedras Blancas, just south of the lighthouse. Hi Richard, thanks so much for taking the time to comment. We always love to hear from locals:) I found that the elephant seal rookery and lighthouse have San Simeon addresses, is Piedras Blancas an actual town? But yes for those visiting, they are both located a few miles north of San Simeon, just keep driving along the Highway 1 (Cabrillo Highway) and they are both hard to miss. Your photographs are STUNNING!! You ought to sell them on your blog! Looks like such a beautiful place to visit, and such variety. I have to say that carved wooden ceiling is incredible – I just don’t think we make things like that anymore. I’d definitely visit here. Thanks Seana! Yes, most of these photos were taken by Laurence, who does sell photos on his travel website, Finding the Universe or readers can just email us. Yes, Hearst Castle is amazing and it is definitely one of the biggest tourists attractions in Central California. It is a bit sad that Hearst was able to buy and take all these treasures from Europe and the Middle East (the ceiling I believe came from an old Italian monastery) but it is certainly beautiful!